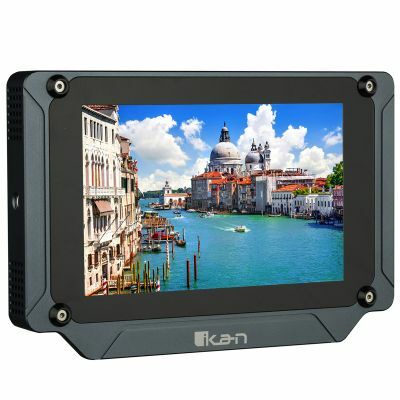 The Ikan Saga line of LCD monitors are designed to help you tell your story. The 7” super bright SX7 is designed with high end features, durability, and field use in mind. The SX7 is viewable in even the brightest conditions with its super bright 1700 nit LCD panel. With the aluminum chassis and gorilla glass the SX7 is able to survive any production shoot. The monitor’s high end software features such as scopes and 3D-LUTs help you get the right shot the first time. The Saga SX7 is equipped with an LCD panel that cranks out 1700 nits of brightness. This is about 3 times as bright as most monitors. Not only is the panel bright but it is also extremely sharp and accurate. The SX7 is packed with video analysis features that help you to get the perfect picture. The monitor has highly accurate Waveform, Vectorscope, RGB Parade and Histogram. The SX7 also has up to 8 channel audio level meters. Not only is the SX7’s LCD panel bright it is also high resolution. The 1920 x 1200 resolution gives you a sharp picture and the IPS technology gives you great viewing angles and accurate colors. The S7X is equipped with both HDMI and 3G-SDI inputs and outputs. In addition the monitor also has a 3.5mm headphone output so you can monitor you audio from the S7X. Tally is also included as well as a USB port for software upgrades and importing 3D-LUTs. The 5V from the USB port will also power various 5V devices. The S7X support both pro batteries as well as DV batteries. Support for pro batteries ensures all day run times and support for DV batteries allows for low cost power options. The monitor also features a mini-XLR power input for a secure connection.